QR Droid is the most complete, feature-packed QR Code and Barcode app available for Android smartphones and tablets. It’s free (and ad-free)! 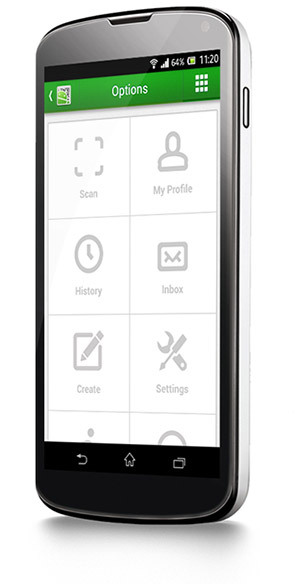 Change your smartphone into a powerful QR Code, Barcode, and Data Matrix scanning utility. Import, create, use, and share data in a matter of taps. This intuitive, full-featured and multi-language QR utility will change the way you interact with QR Codes and their smart actions and activities. QR Droid allows you to scan barcodes, compare products and prices, read product reviews and shop from the comfort of your Smartphone. This app is free and Ad-free. Download QR Droid on Google Play, Amazon Store or Direct Download. QR-WiFi is a plugin for the QR Droid app. It allows you to automatically connect to a WiFi Network after scanning a WiFi QR Code. This plugin cannot be launched by itself, and requires QR Droid 5.3 (or greater) in order to use it. This plugin is free and Ad-free. Download QR-WiFi Plugin on Google Play or Amazon Store. Business Card widget: Show your business card(s) as a QR code. Others can scan the code right from your home screen and get your info in an instant. Shortcut widget: Place the QR Droid action bar, direct on your home screen, for single tap access to the main features of QR Droid. NOTE: QR Droid Widgets contains additional widgets to those already bundled with the QR Droid and QR Droid Private applications. Download QR Droid Widgets on Google Play or Amazon Store. QR Droid Private is the exact same application as QR Droid, except it does not contain certain functionality that requires the permissions READ_CONTACTS and READ_HISTORY_BOOKMARKS. These permissions are required for when QR Droid allows you to create a QR Code from a contact stored on your device by no more than a few taps. You can browse all your stored contacts, select one and generate a QR Code, all without typing anything. In order to do this, QR Droid requires the “READ_CONTACTS” permission. Similarly you can create a QR Code of a bookmark by simply selecting the bookmark without having to type anything, this requires the “READ_HISTORY_BOOKMARKS” permission. We know that some users do not like giving access to these permissions, so we created QR Droid Private. This app does not read your contacts or bookmarks but you do have to manually enter this information if you want to create these kinds of QR Codes e.g Contacts and Web Addresses. Please do note however, that ALL your information is secure and will never leave your device, no matter what version of QR Droid you use. This app is free and Ad-free. Download QR Droid Private on Google Play or Direct Download. QR-GPS is a plugin for the QR Droid app. It allows you to create a QR Code from your current location or of another location, using your device’s GPS. You can then easily share your location or desired location, contained in the created QR Code, with friends, family and colleagues. This plugin cannot be launched by itself, and requires QR Droid 4.1 (or greater) in order to use it. This plugin is free and Ad-free. Download QR-GPS on Google Play or Amazon Store. For App Developers & Web Masters Only. This is a demo for Android developers who want to use “QR Droid” services, for free, in their own apps. This app is free and Ad-free. Download QR Droid Services on Google Play.